One in a series of Mathematics Wall Posters for Primary, Middle School and High School classrooms, that will address all Common Core Standards concepts. This set of wall posters are designed to display in an uncluttered manner, basic introductory concepts in Linear Geometry. Suitable for lower and middle grades classes. Each poster has a short explanatory definition and straightforward diagram for each concept. The preview shows all the posters enclosed. They can be printed on any color paper with no loss of clarity. We can produce custom order work upon request. We post all our new products, answer questions and take suggestions, run contests and frequently post freebies. This product comes as JPGS, PNGS and a PDF file, in 300 dpi hi-res 11x17 inch landscape format. It can be printed on any printer either in you school, or at commercial vendors. You can also print in smaller formats as well such 8.5 x 11 letter size. These posters can also be Laminated for long term use. 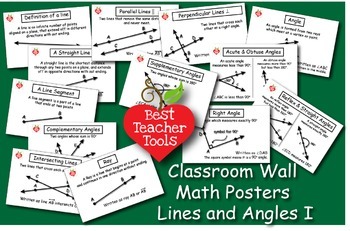 All right reserved by BestTeacherTools. The purchase of this product is for a single classroom use only. No part of this product may be distributed, published, or transmitted electronically or otherwise, without the written permission of the author. This product may not be posted on the internet, classroom or district websites included. Additional licenses for department members or other teachers may be purchased from my store at a discount price! All rights reserved ©2017 BestTeacherTools.